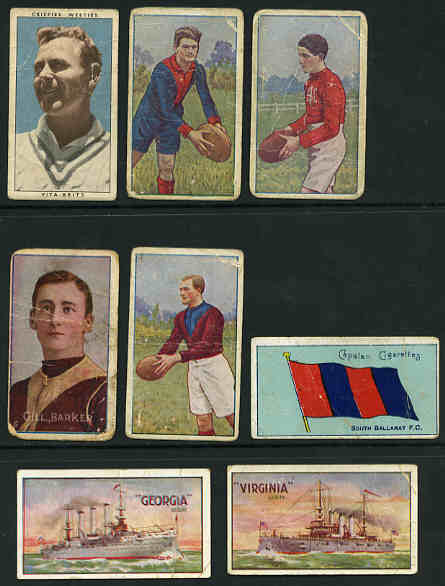 Selection of 230 ATC cigarette cards including 1890-1902 Beauties with scarce Orange Frameline (12), Dull Background (30), Black Background (4), Victoria and NSW Backs (10), Green Net Back (13), 1895 Flags of all Nations (6), 1900 Old and Ancient Ships (12), 1900 Celebrities (7), 1900 Flower Girls (5), 1900 Marine Girls (3), 1901 Actresses Photographic (74), 1901 Australian Parliament (6), 1901 Comic Scenes (4), 1901 Boer War Celebrities (8), 1903 Palette Girls (10, plus 2 with red border) and more in plastic leaves in cigarette card album. Some faults, but generally in very good to excellent condition. Catalogue Value over $2,400.00. 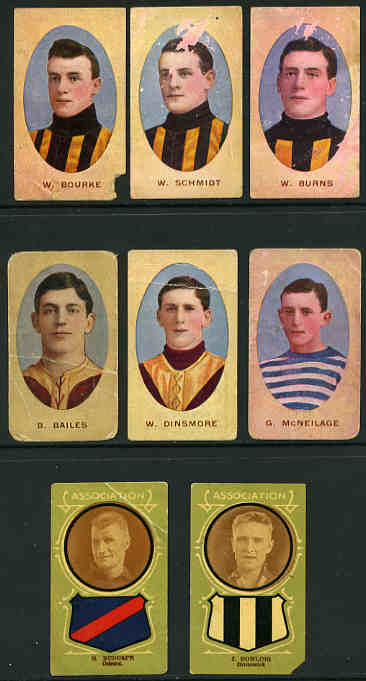 Selection of 258 Sniders and Abraham cigarette cards including 1904 Natives of the World (5), 1905 Actresses gold background (11), 1905 Actresses white borders (3), 1906 Cricketers in Action (2), 1906 Australian Racehorses with horizontal backs (17), 1906 Jokes (16), 1906 Views of Victoria in 1857 (4), 1907 Australian Racehorses with vertical backs (14), 1907 Cartoons and Caricatures (3), 1907-08 Australian Jockeys blue backs (9) and brown backs (21), 1908 Admirals and Warships (5 Admirals), 1909 Dickens Series (3), 1909 Shakespeare Characters (8), 1911 Australian Racing Scenes (9), 1912 Animals (32), 1912 Animals and Birds mixed backs (42), 1914 Butterflies and Moths mixed backs (28), 1915 Medals and Decorations (10) and 1917 Australian V.C. 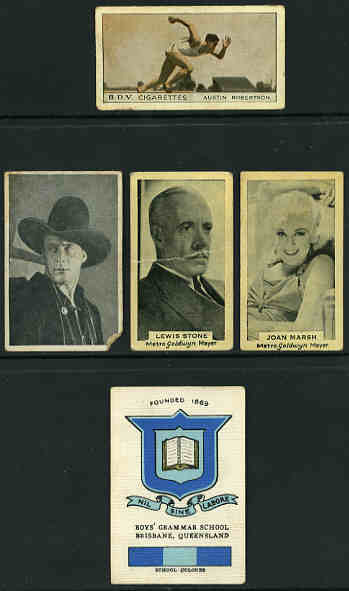 's and Officers (12) and more in plastic leaves in cigarette card album. Some faults, but generally in very good to excellent condition. Catalogue Value $2,465.00. 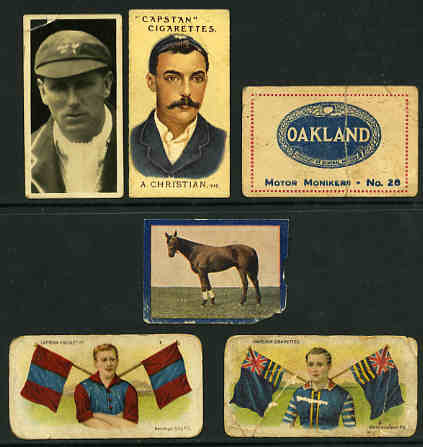 Selection of 233 different Sniders and Abrahams and Wills cigarette cards including Sniders and Abrahams 1904 Natives of the World (7), 1905 Naval Terms (3), 1905 Cricket Terms (4), 1907 Australian Football-Incidents in Play (10), 1907 Australian Racehorses (18), 1908 Admirals and Warships (3), 1910 Australian Footballers-Head in Oval (19), 1911 Australian Racing Scenes (12), Wills 1906 Melbourne Cup Winners (16), 1906 Horses of Today (6), 1907 Time and Money in Different Countries (13), 1907 A Tour Round the World (10), 1908 Flag Girls of all Nations (21), 1909 Australian and English Cricketers-Blue Border (2), 1910 Australian and South African Cricketers-Blue Border (13) and Red Border (4), 1910 Types of the Commonwealth Forces (21), 1911 Australian and English Cricketers (7), 1912 Types of the British Army (27) and more. All with varying faults. Catalogue Value $2,870.00. 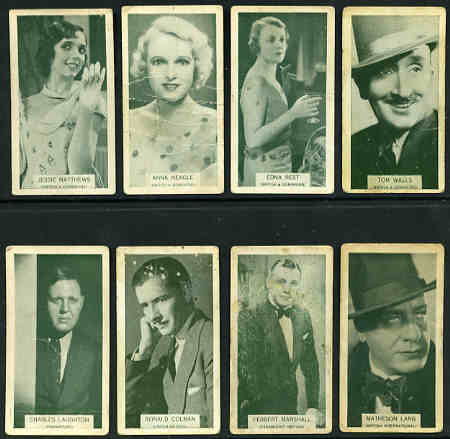 Selection of 136 different Sniders and Abraham cigarette cards including 1905 Actresses gold background (6), 1905 Actresses white borders (3), 1906 Views of Victoria in 1857 (15), 1907 How to Keep Fit (14), 1909 Dickens Series (12), 1909 Shakespeare Characters (16), 1912 Animals (5), 1912 Animals and Birds complete set of 60 and 1915 Crests of British Warships (5). Some with faults, others in good condition. Catalogue Value $1,230.00. Wills 1898 Conundrums complete set of 25 mainly in very good condition. Wills 1905 Interesting Buildings complete set of 50 in good to very good condition. Catalogue Value $230.00. 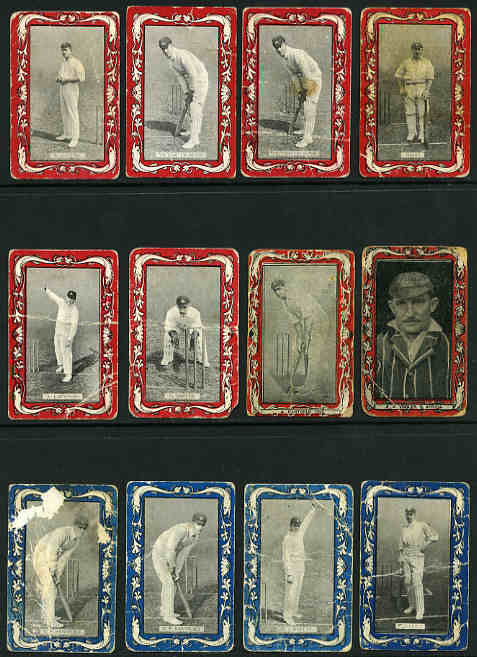 1905-06 Wills W. Bruce, H. Carter, N. Claxton, F.H. Coombe, J.J. Kelly, A. McBeth, P.M. Newland, L.O. 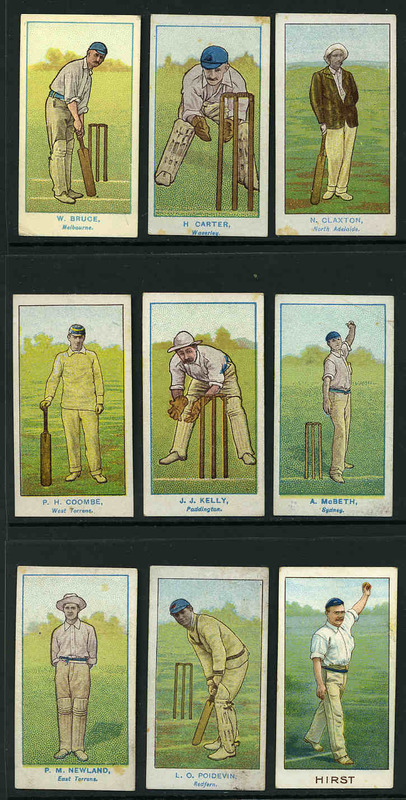 Poidevin Australian Club Cricketers and 1903 Wills Hirst Australian and English Cricketer cards. 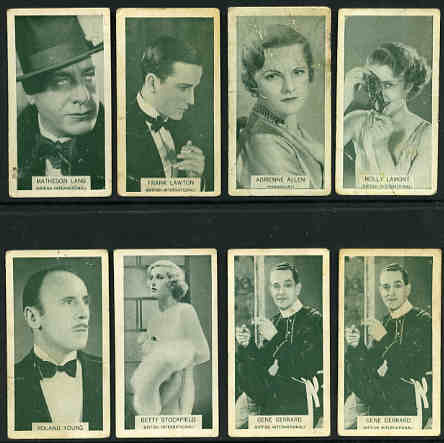 Attractive cards in fine condition with the odd minor blemish. 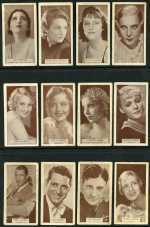 Selection of 251 Wills cigarette cards including 1905 Interesting Buildings (17), 1907 Time and Money in Different Countries (37), 1908 Flag Girls of all Nations (35), 1912 Birds of Australasia (26), 1913 British Empire Series (22), 1913 Royal Mail (36), 1915 War Incidents (28) and more in cigarette album. Some faults, but many in very good condition. Catalogue Value $916.00. 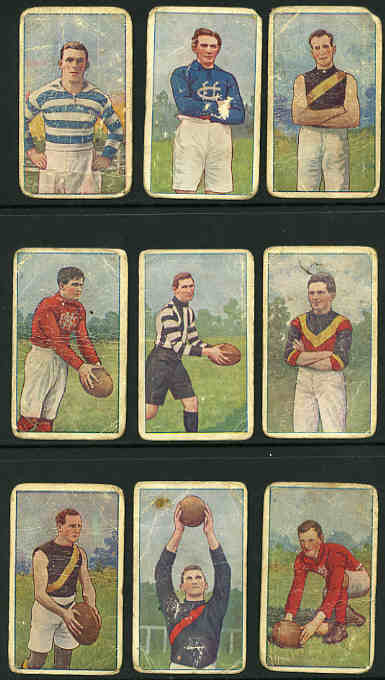 Selection of 447 Wills cigarette cards including 1898 Conundrums (8), 1903 Australian and English Cricketers (10), 1907 Time and Money in Different Countries set of 50 (6 with Havelock backs), 1910 Arms of the British Empire (37), 1910 Aviation (55), 1910 The Worlds Dreadnoughts (19), 1911 Australian and English Cricketers (3), 1911 United States Warships (45), 1912 Birds of Australasia (16), 1912 Fish of Australasia (21), 1912 Types of the British Army (53), 1913 Animals cut-outs (58), 1913 Football Club Colours and Flags (3), 1915 Britain's Defenders (10), 1915 Modern War Weapons (32), 1915 Victoria Cross Heroes (7), 1923 Practical Wireless (3) and 1934 Wild Animals large card (17). Mixed backs. Also BAT 1908 Girls of all Nations (30). Some faults, but many in very good condition. Catalogue Value $2,140.00. Selection of 373 different Wills cigarette cards including 1910 Aviation (56), 1910 Arms and Armour (14), 1912 Birds of Australasia Yellow backs (12), 1912 British Empire Series (16), 1912 Fish of Australasia (14), 1912 Signalling Series (16), 1912 Types of the British Army (11), 1913 Animals cut-outs (12), 1913 Australian Wild Flowers (16), 1913 Historic Events (14), 1914 Australian Butterflies silk (16), 1915 Britain's Defenders (16), 1915 Modern War Weapons (26, 5 with Havelock backs), 1915 Victoria Cross Heroes (10), 1915 War Incidents A Series (14) and 2nd Series (13), 1915 War Pictures (5), 1927-28 Dogs (21), 1929 Crests and Colours of Australian Universities, Colleges and Schools (35) and 1929 English Period Costumes (36). Also Godfrey Phillips 1933 Who's Who in Australian Sport (8), Nicolos Sarony and Co (Australia) 1927 Links with the Past (29), Players (GB) 1916 Polar Exploration 2nd Series (6), Wills (GB) 1902 Kings and Queens (16) and more. Some faults, but many in very good condition. Catalogue Value $1,780.00. 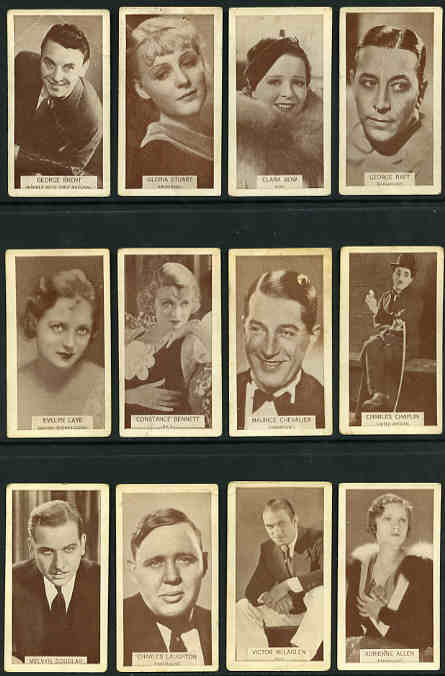 Selection of 79 cigarette cards including Ardath 1934 British Born Film Stars (16), Wills 1913 Popular Flowers Silk (9), 1933 Famous Film Stars Photographic (12) and more. Mainly fine condition with odd duplicate. Catalogue Value $341.00. 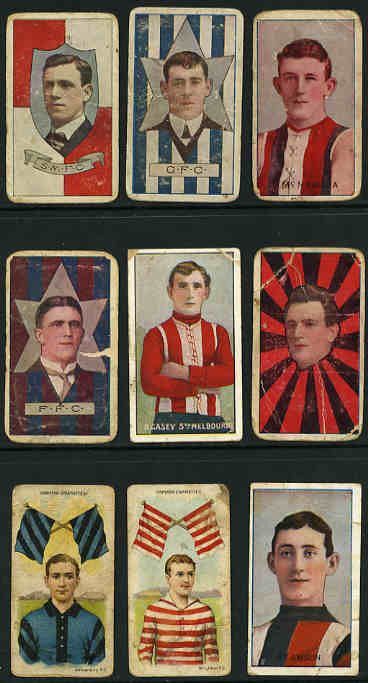 Selection of 58 cigarette cards, with a few trade cards including Schuch 1920 Footballers (12), Schuch 1925 Portraits of leading Footballers (2), various Sniders and Abrahams Footballers (14), Wills 1905-15 Football Club Colours and Flags (4), 1909 Wills Australian and English Cricketers (10) and more. 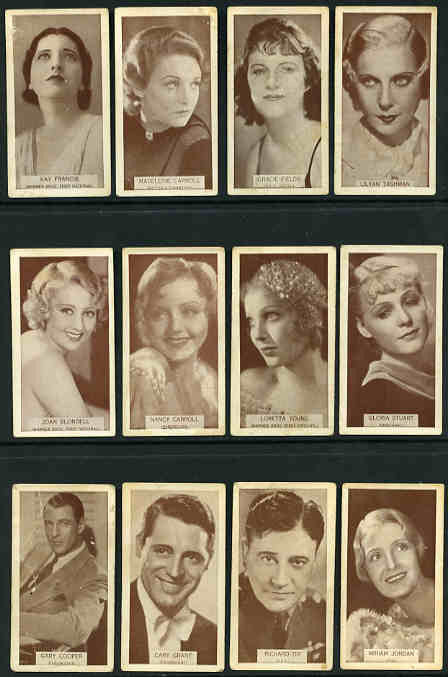 All with faults, the odd trade card and a few duplicates. Very high catalogue value. 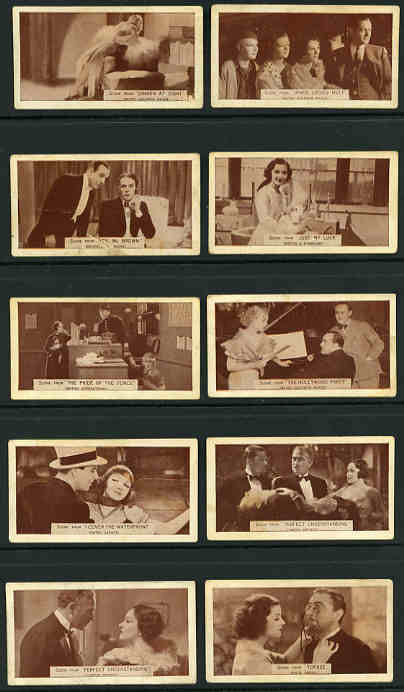 Richard Benson 1925 Old Bristol Series set of 24, Cavanders 1924 The Homeland Series (Plain Backs) set of 28, Major Drapkin 1916 Celebrities of the Great War (Printed Back) set of 36, Gallaher 1935 Champions 1st series (No Captions on Front) set of 48, Lambert and Butler 1930 Garden Life set of 25, Millhoff 1929 Zoological Studies set of 36, Stephen Mitchell 1923 Famous Crosses set of 25, Morris and Sons 1932 Whipsnade Zoo set of 25, Godfrey Phillips 1935 The "Old Country" set of 48 and 1938 Aircraft series No 1 set of 54. All in very good to excellent condition. Catalogue Value $554.00. Cavanders 1924 The Homeland Series "Real Photos" set of 56, Gallahers 1937 The Navy (Park Drive) set of 48, Lambert and Butler 1929 Fauna of Rhodesia set of 25, Millhoff 1933 Real Photographs 5th Series set of 27 and Wills 1922 Do You Know 1st Series set of 50 and 1923 Gardening Hints set of 50. Also Wills New Zealand 1926 "Zoo" set of 50, 1927 Household Hints (Wills at top back) set of 50, 1928 A Sporting Holiday in New Zealand set of 50 and 1928 Beautiful New Zealand set of 50. All in very good to excellent condition. Catalogue Value $480.00. Millhoff 1928 England Historic & Picturesque 1st and 2nd series sets of 25, 1929 Gallery Pictures set of 25, 1930 In the Public Eye set of 36, 1931 Picturesque Old England set of 25 and 1931-33 Real Photographs 1st, 3rd, 4th, 5th and 6th series sets of 27 mainly in very good to excellent condition. Catalogue Value $497.00. Ogden's 1924 Foreign Birds (35), 1925 Modern British Pottery (34), Players 1910 Regimental Colours and Cap Badges (12), 1932 Dandies (30), 1932 Wild Birds (45), 1933 Boy Scout and Girl Guide (38) and a few odd issues, mainly in very good condition. Catalogue Value $264.00. Players 1908 Products of the World set of 25, 1916 Players Past and Present set of 25, 1928 Flags of the League of Nations set of 50, 1932 Dandies set of 50, 1933 Boy Scout and Girl Guide set of 50 and 1937 Coronation Series - Ceremonial Dress set of 50 in excellent condition. Catalogue Value $208.00. 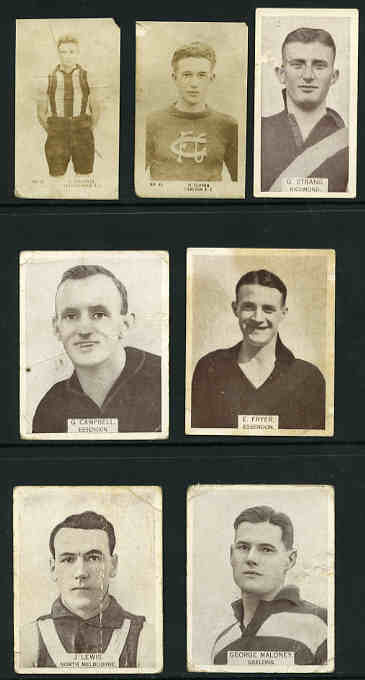 Players Cricketers 1934 set of 50 in very good condition in old Players Navy Cut cigarette packet. (card 49 with slight staining). Also Players Cricketers 1938 (Adhesive) 38/50 and Wills 1939 Life in the Royal Navy (Adhesive) set of 50 with some faults in 2 old Wills Capstan cigarette packets. Catalogue Value $247.00. 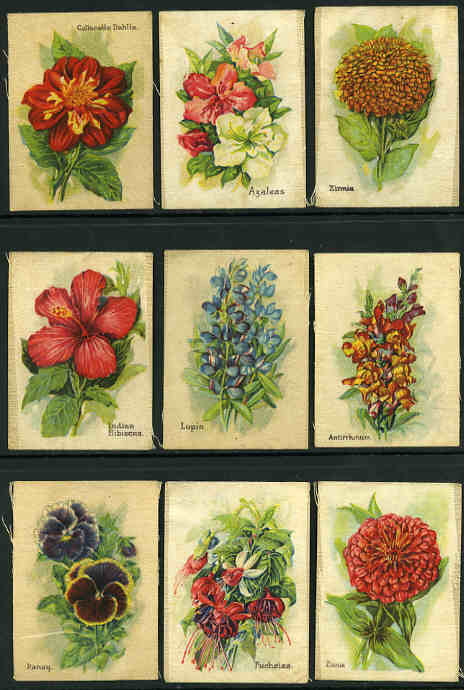 Selection of 160 different cigarette cards including Carreras 1916 Raemaekers War Cartoons (7), Gallaher 1912 Votaries of the Weed (4), Lambert and Butler 1923 Motor Cycles (15), 1923 Motor Cars 2nd Series (10), R.J. Lea 1912 Miniatures (6), Godfrey Phillips 1902 Guinea Gold Series (5), Players 1909 Nature Series (13), Taddy and Co 1912 British Medals and Decorations (3), Wills 1896 Cricketers (1), 1898 Kings and Queens (12), 1914 Musical Celebrities (13), 1914 Beauties Picture Hats (3), 1924 Birds Beasts and Fishes (17), 1929 Rigs of Ships (14) and more. Mainly in very good to excellent condition. Catalogue Value $1,285.00. 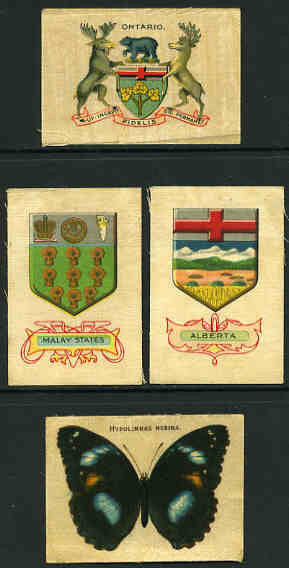 South Africa United Tobacco Companies (South) Ltd 1931 South African Coat of Arms complete set of 52, 1940 Our South African Flora complete set of 100 and Germany Aviatik Cigarette Company 1934 Wonders of the Past and Future complete set of 200 in excellent condition. Cigarette Card Album with cardboard slipcase in new condition. 17cm x 33cm with "Cigarette Card Album" gold lettering on front. (4).